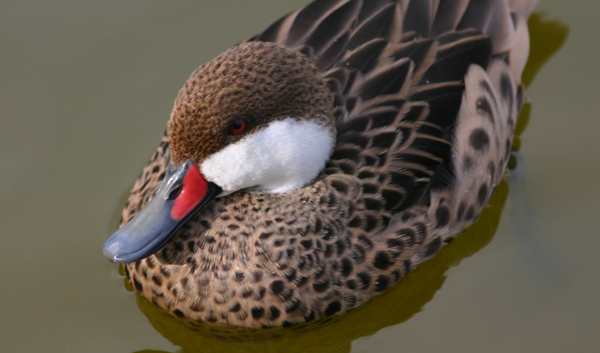 Like you, I’ve seen a lot of ducks in my life, but it wasn’t until 2006 that I first beheld the the wondrous waterfowl that I’d come to regard as my favorite duck, bar none – the White-cheeked Pintail. 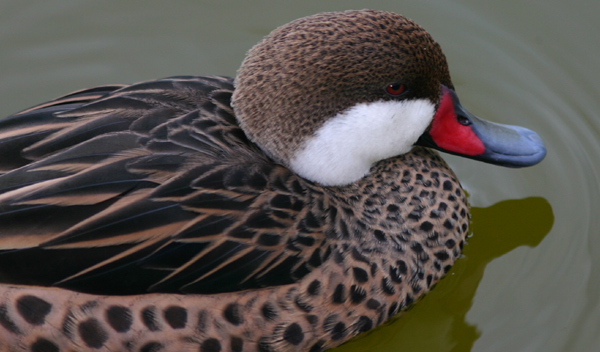 The White cheeked Pintail (Anas bahamensis), also known as the Bahama Pintail, is a dabbling duck that plies brackish waterways throughout its range. Three similar subspecies are distributed regionally from the Caribbean to South America and the Galápagos Islands. The Bahama Pintail is a truly beautiful duck with a divinely dappled fawn breast and spiky scalloping adorning plumage of black and rufous. What really sets this bird apart, however, is a vibrant bill of hot pink and periwinkle set off by those signature cheeks of snowy white. Like most southern ducks, this one is not dimorphic which means the males and females are equally enchanting. This precious little pipsqueak is related to other pintails in the subgenus Dafila such as the higher profile Northern Pintail. However, it most closely resembles other birds in its subgenus like Red-billed Teal (Anas erythrorhyncha) or Cape Teal (Anas capensis). Paradise Island in the Bahamas is, in my experience, a perfect place to spy these pintails. Undaunted by larger moorhens or Neotropic Cormorants, White-cheeked Pintails in their festive flocks seem perfectly suited to that relaxed West Indies environment. Tai, I think the Bahama pintail is your pintail… your light must be better! It is our pintail but ours seem a little lighter to me – probably environmental (food or light or something) differences. 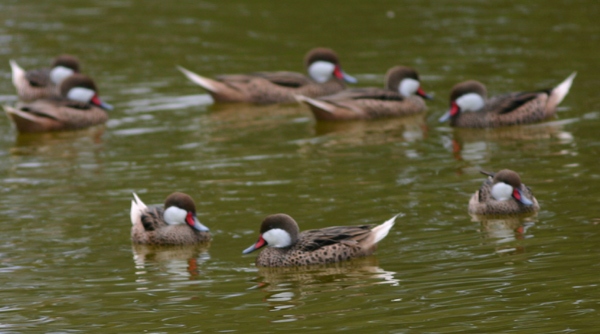 I was able to see Northern Pintails this weekend. I’ve never heard of a Bahama Pintail but it’s an awesome looking duck – nice photos! That sure is a beautifully colored duck. And great photos of it. could you pleasee tell me the main differences between this duck and the subspecies of the galapagos…. You might be interested to know that I saw a pintail in Scotland!I think it’s a white cheeked pintail. Who know’s how it ended up there. If you google Birnie loch pintail you can see some photographs of it. we saw a white cheeked pintail whist walking down the canal in Shardlow,Derbyshire. It was a single bird in a flock of mallards on the 23 december 2009. How lucky are we!!!!! 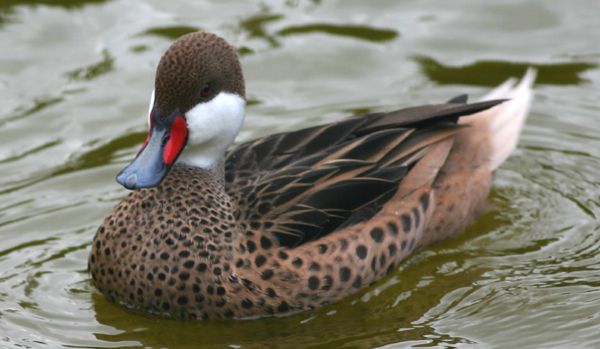 Wow, Glenn & Lizzie… a white-cheeked pintail in the UK sounds like a real rarity. Congrats! I saw this duck yesterday January 10th 2010, whilst walking along the canal in Sharlow, perhaps he has escaped from somewhere? I saw a pair of white cheeked pintails on the River Avon nr Bitton, South Gloucestershire, May 5th 2010, and every day since. They seem to hang around with a manderin and the occasional mallard, but tend to be quite aggressive towards them. On the other hand the Mute Swan family are quite aggressive toward the WCP. One of them appears to be ringed but both appear quite happy amongst the reeds. The Galapagos race A. b. galapagensis is apparantly smaller, duller in colour and has faint grey flecks on the white cheeks/throat. There’s a photo of one I took in the Galapagos here – http://www.flickr.com/photos/leedingain/6776276945/in/set-72157629065477885. 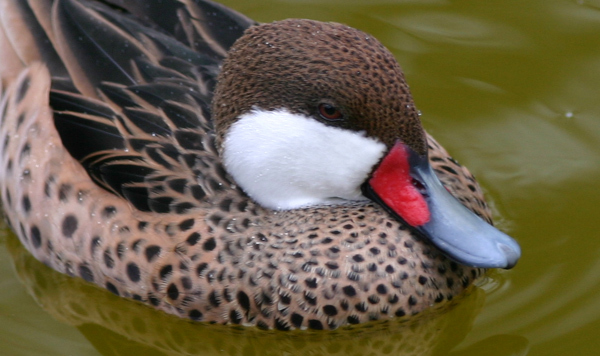 White-cheeked Pintail are commonly kept in collections in the UK and often escape. I’m 99% sure that it was this bird I saw in our lake, here in Northern Alabama. It was with a group of female mallards. Do they make their way so far North? @A Fischer, I wouldn’t say that could never happen, but a rare duck like that is more likely an exotic escapee than a vagrant. Check with your local birding chapter… if they don’t already know about your bird, they’ll definitely want to! We rescued a duckling white-cheeked pintail about 2 months ago on Rose Island, near Nassau, he was being chased by sea gulls and dogs, the mother was nowhere around. We could not find anyone to look after him so we ended up taking him along with us on our sailboat. We are now in Luperón in the Dominican Republic and are a bit at a lost at to what to do with him. Should we just let him fly away and hope for the best, or should we take him to our friends’ farm inland?